One of your biggest jobs as a pet owner is to housetrain your dog so you aren’t always cleaning up after it inside. 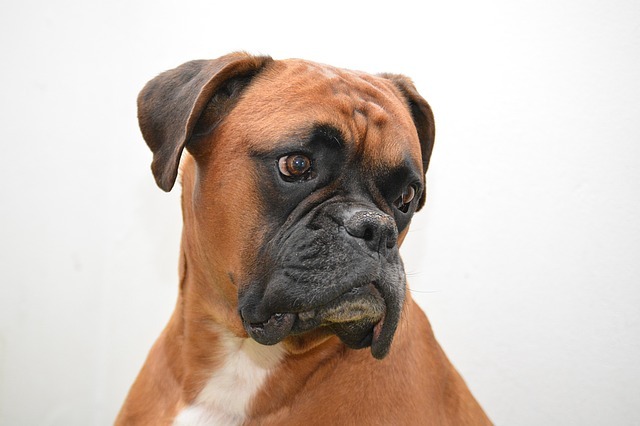 It’s normal for your dog to have the occasional accident, but if he starts to do it frequently or if you notice other changes in its urinary habits, it could be an indication of a problem. 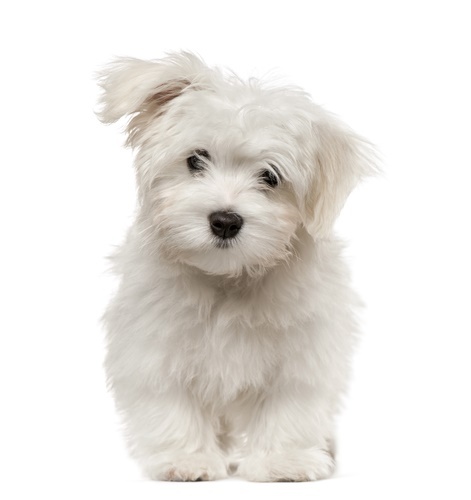 Take your dog to the vet for a diagnosis and consider switching to a dog food for urinary health. Made with wholesome natural ingredients for digestibility and maximum nutrition, Blue Buffalo Life Protection Formula Chicken & Brown Rice Recipe is our top pick for the best dog food for urinary health. Continue reading to learn more about your dog’s minimum needs for nutrition and to receive some simply simple tips for picking the best dog food to provide for those needs. You’ll also receive our top 5 picks for the best dog food for urinary health. 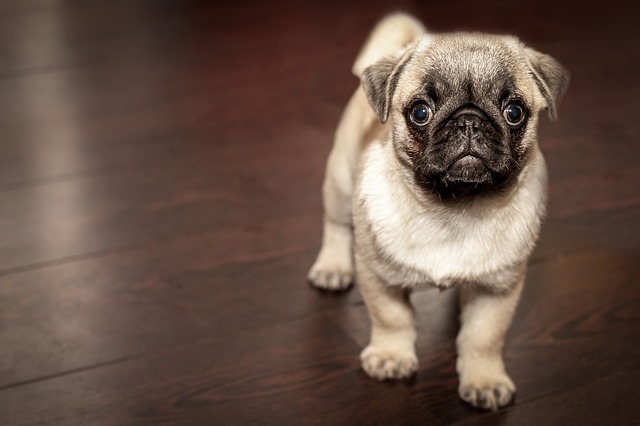 Some of the most common urinary problems in dogs include bladder stones, incontinence, bacterial infections, cancer, and even obstruction of the urethra. These things can be caused by a number of factors such as inflammation or infection of the bladder, drinking too much water, hormonal imbalance, trauma, stress, anatomical abnormalities, and high uric acid levels. If you suspect that your dog is suffering from a urinary health problem, talk to your veterinarian right away. In addition to treating the condition, you should also switch to a dog food for urinary health. Natural Ingredients. The quality of your dog’s diet is always important, so choose a recipe made with wholesome natural ingredients, free from fillers and additives. Moderate Protein. Some veterinarians say that low-protein diets dissolve bladder stones more quickly, but your dog requires protein for lean muscle mass so choose a moderate-protein diet. Calcium and Phosphorus. These minerals are important for bone health, but high levels can increase the uric acid content of your dog’s urine, so look for a recipe with controlled levels. Moisture. Hydration is an important aspect of urinary health, so look for a dog food with higher levels of moisture or consider moistening your dog’s food with water or chicken broth. All dogs have the same basic requirements when it comes to the three macronutrients – protein, fat, and carbohydrates. Protein provides the building blocks for healthy muscles and helps your dog maintain a good body weight. This nutrient should come from animal sources like meat, poultry, and fish because these are complete proteins – they contain all 10 essential amino acids. 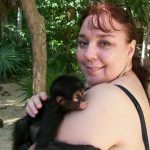 Fat is another nutrient that is best when it comes from animal sources. Things like salmon oil and chicken fat are easier for your dog’s body to metabolize than plant fats like flaxseed or sunflower seed oil. Plant fats can be used for supplemental energy and fiber, however. Your dog has a limited ability to digest plant products, so keep the carbohydrate content of its food limited. The most digestible sources of carbohydrate for dogs are whole grains and vegetables. Fresh fruits and vegetables can provide additional energy and healthy fiber while also being natural sources for key vitamins and minerals. You should also include beneficial supplements like chelated minerals, prebiotics, and probiotics in your dog’s food. Keep reading to see our top 5 recommendations for the best dog food for urinary health. Now that you have a better understanding of your dog’s nutritional requirements and its urinary health, you’re ready to start shopping for dog food! Remember, it should be made with wholesome natural ingredients including moderate levels of high-quality protein, healthy fats, and digestible carbohydrates. 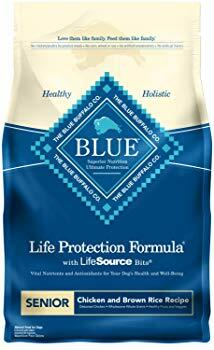 If you’re looking for an all-natural dog food made with wholesome ingredients, this Blue Buffalo Life Protection Formula Chicken & Brown Rice Recipe is the way to go. It features lean chicken as the main ingredient with digestible brown rice for carbohydrate support. This recipe contains an ideal blend of omega-3 and omega-6 fatty acids for healthy skin and coat, plus a precise blend of antioxidants for complete and balanced nutrition. Plus, it is moderate in protein with ample fat for energy. 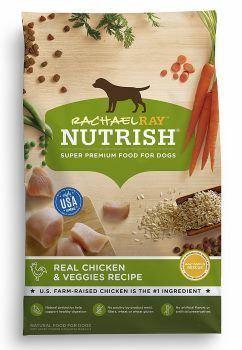 If you’re looking for an affordable dog food that will support your dog’s urinary health, try this Rachael Ray Nutrish Natural Chicken & Veggies Recipe. It features farm-raised chicken as the main ingredient with other natural ingredients like brown rice, fish meal, and chicken fat. This recipe is rich in omega fatty acids for healthy skin and coat, plus the ideal blend of calcium and phosphorus for urinary health. It also contains chelated minerals to ensure optimal nutrient absorption. 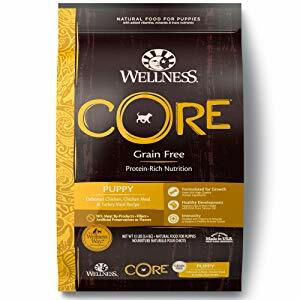 To get your puppy started on the right foot with a wholesome diet that also supports its urinary health, try this Wellness CORE Grain-Free Puppy Recipe. It features deboned chicken as a lean source of protein with digestible grain-free carbohydrates like potatoes and peas. This recipe is rich in omega fatty acids for healthy skin and coat, plus it is supplemented with probiotics for digestion. It also contains controlled levels of calcium and phosphorus for urinary health. 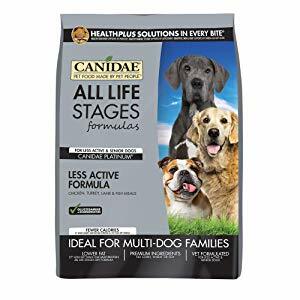 If you’re concerned about your senior dog gaining weight but you still want a dog food that will support its urinary health, try this Canidae All Life Stages Dry Dog Food. It features chicken meal as a lean source of protein and natural source of joint-supporting glucosamine and chondroitin. 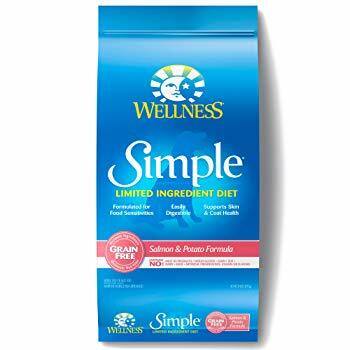 It also contains digestible whole grains, healthy fats, and superfood ingredients for balanced nutrition. Overall, it is moderate in protein (22.5%), low in fat (10.5%), which plenty of fiber for digestion. This Wellness Simple Natural LID Salmon & Potato Recipe is a great option for dogs with food allergies because it contains a limited number of main ingredients which limits the risk for triggering an allergy or sensitivity. It features salmon as the main ingredient which is a rich source of protein and omega fatty acids with potato as a digestible grain-free carbohydrate. This recipe is completely free from fillers, by-products, and artificial additives and supplemented with vitamins and minerals for nutritional balance. There is no one-size-fits-all answer to the question of how much to feed your dog because its needs will vary depending on its age, breed size, body weight, and activity level. Start with a dog food that is made for your dog’s breed size (such as a small-breed or large-breed recipe) then check the feeding recommendations on the package according to your dog’s age and weight. Take that amount and divide it by two or three to determine the right size for each of your dog’s meals. Keep in mind that puppies and small breeds will need three meals a day while large dogs can get by with just two meals. You should also check the feeding recommendations every six months or so to see if you need to make any adjustments as your dog ages and grows. Food allergies and sensitivities are fairly common in dogs and they often present with skin-related symptoms. If your dog has recurrent ear infections or skin problems, it could be a sign of an allergy or sensitivity, so you should change its diet to eliminate the offending ingredient. To determine what ingredient your dog is allergic to, start by switching to a limited ingredient diet made with a novel (new) source of protein and carbohydrate. After 10 to 12 weeks, if all signs of the allergy disappear, you can then introduce potential allergens one at a time until you find the problem. After that, simply choose a dog food that doesn’t contain that ingredient. Now that you have a better understanding of your dog’s nutritional needs and its urinary health, you’re ready to start shopping for dog food. Remember, it should be made with wholesome natural ingredients including moderate levels of high-quality protein, healthy fats, and digestible carbohydrates. 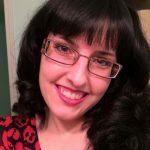 If you’re not sure where to start, try one of our top 5 picks reviewed above!